The whitewash paint has gone. Now the windows of a prominent empty unit in Wantage town centre features the work of a group of local artists. 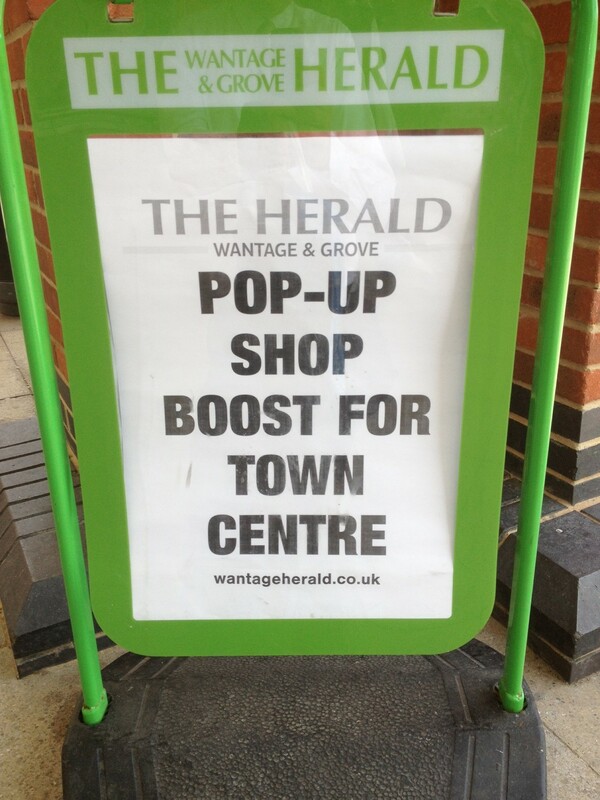 It’s the latest initiative by Wantage Town Team as part of their work to improve the look of empty town centre units while work to sell or let them continues. Work by members of the Wantage Art Group features in a display behind the widows of the former Hodson’s estate agency unit on the corner of Market Place and Newbury Street. It follows an intervention by Wantage Mayor, Cllr Steve Trinder, who wrote to the trustees of the fund that owns the building to ask if the art work could replace the whitewash and improve the look of the unit for the benefit of its neighbours and the town as a whole, until a new occupier is ready to move in. The unit is being sold by local agent Green & Co, who say there has been positive interest in it, but that there is background work to be done before a sale can go through and it’s likely to be the new year before that’s completed. The total number of empty and available units in Wantage town centre is now back in single figures after a spring/summer increase in numbers, and further new openings are planned before the year’s end.